And now as an adult who also likes to sleep in, I love having someone else cook me breakfast. There are a whole lot of places to get great breakfast in Birmingham, and we just got another one. Over Easy opened a couple weeks ago in the newly renovated strip mall on Hollywood Boulevard in Homewood, and the lines are already out the door on Saturday and Sunday mornings. The al.com story about the restaurant’s opening piqued my interest, as it mentioned Over Easy being inspired by the legendary Big Bad Breakfast. Opened by John Currence, James Beard Award winner and best chef in Oxford, Miss., the place just serves simple breakfast classics, but it’s earned national foodie fame (okay, maybe Southern-regional foodie fame). Point is, Over Easy makes seriously good breakfast. Like so good that after I tried it for the first time Saturday, I went back again Sunday. 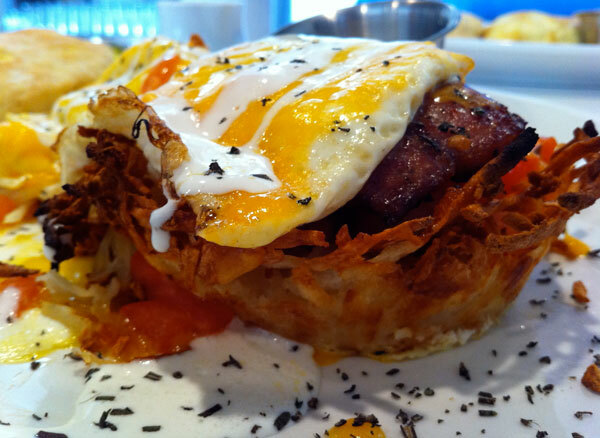 The most unique item on the menu is the Hash Baskets (pictured above)—hash browns cooked in a cup shape and filled with an egg (over easy—ha! ), tomato, cheese, and your choice of meat. It also comes topped with a little creme fraiche and minced chive—this is a little more gourmet than your average breakfast joint. I also tried the Classic Eggs Benedict (left), which is made with extra-salty, extra-savory country ham and a perfectly undercooked egg. 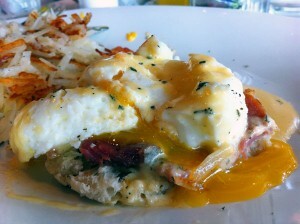 (The egg for a great Benedict needs to have a completely liquid yolk. This is an objective fact.) The “eggs” part of the name is a bit of a misnomer, as this dish only includes one egg, but with the generous pile of hash browns on the plate it’s still a good breakfast. Over Easy’s menu is dominated by egg dishes, but there are also several pancake variations and a French toast. I got to taste the pancakes too, which are nice and fluffy and really sweet and buttery, and the scrambled eggs with them were made from actual eggs, not powdered or pasteurized. Over Easy is open for breakfast and lunch every day but Monday. There are some salads and sandwiches on the menu, but they feel like an afterthought—the breakfast dishes are the big draw. Expect to wait a while if you come on Saturday or Sunday morning, but it’s worth it, and you’ll probably run into somebody you know while you’re waiting. One problem I can foresee: parking. The tiny lot in front of Over Easy’s shopping center was full to overflowing on Sunday, and the liquor store and Mexican restaurant going into the center haven’t even opened yet. But honestly that’s a good problem to have. Yum! Can’t wait to go! In fact, thinking of ditching my cheap, brought-from-home lunch to go here instead. Depends how cheap you are. The Hash Basket’s eight bucks, and everything else is right around there. Breakfast or lunch for two is gonna run you $20-25 with tax & tip. I’ve only been once so far. I got the oatmeal pancakes (which I’ve also had before at Big Bad Breakfast). They did not disappoint! Although, I wish they were served with a fruit topping and fresh whipped cream like at BBB. I did the same thing! I ate there with a friend on a Friday. (I ordered the breakfast sandwich on wheat with veggie sausage.) Then I went back the next day for the exact same order. It was sooooo good. Have you been back? Thinking of trying for the first time, but Urban Spoon reviews are pretty bitchy. Menu looks good, though! No idea what the haters’ problem is, but I’ve been back two or three times since I wrote this and it’s still delicious. One caveat: The egg dishes are better than the pancakes and the like.